How often do you find a cookbook that is so chock full of good recipes that you want to make every single one of them? That day? That’s how I felt when The Sweet Melissa Baking Book by Melissa Murphy arrived in my mailbox. I grabbed the package and took it along in the car when I went to pick up the boys for school, knowing I would have a few minutes to browse while waiting for them. A few minutes was not enough because I found myself pouring over the pages. Many of my cookbooks have sticky flags on the pages with recipes that I like or want to try, but for Murphy’s book I didn’t even bother because I will eventually make everything in it, and the things that I have made so far have been fantastic. Murphy is the chef and owner of Sweet Melissa Patisserie in New York City, a popular bakery considered one of the best in the city. I spent some time on the bakery’s website, wishing I had a spot in my neighborhood with food that good so I could take the laptop and hang out there on my mommy days. The menu is so tempting and her wedding and specialty cakes are breathtaking. I plan to take a trip to New York City sometime, and one of my first stops will be Sweet Melissa, especially if it has WiFi. Because my favorite meal is breakfast, I started in the “Dessert for Breakfast” chapter with her Sweet Muffins recipe. For both her sweet and savory muffins, Murphy encourages variation by not specifying particular fruits or cheeses and vegetables within the text of the recipes, but saves the suggestions for tasty combinations for the end. I made the sweet muffins while Michael’s parents were visiting a few weekends ago, and added apples, cinnamon, and dried cranberries. The muffins were a hit, and it’s a good thing I made a double batch that morning, otherwise there would have been none left for me to photograph. They were perfect right out of the pan, no butter or jam required, with a slightly crispy crust and moist crumb, and the vanilla sugar on top added a sweet, aromatic crunch. I can’t wait to try some savory muffins with a bit of soup and salad. Murphy’s mother tells the story about the family’s “French pancakes” (recipe below) and how her sons still call mom when they want to make crepes for their families. I’ve enjoyed crepes many times for an appetizer or dessert but never made them, and I thought I might make these if I could find a reasonably priced crepe pan. After spotting a nice one at Ross for just $8 (score! ), I knew that crepes were in our near future. I’ve made them two weekends in a row and now my boys ask for crepes every morning. Good thing they are easy to make! The crepes keep well in the refrigerator between sheets of wax paper, so now I plan to make them at night and just warm each one in the pan in the morning so I don’t keep the family waiting. We served the first batch with fried apples and fresh whipped cream with a dusting of cinnamon, and then the second batch with bananas foster and toasted coconut and almonds. Michael saw the bottle of rum on the counter and said, “Rum? For breakfast?” Absolutely, flames and all. It was to die for. And no, we didn’t share the bananas foster crepes with the boys…those were strictly an adult treat! Fortunately the boys were very happy with their cherry, blueberry, and raspberry jam filling. The chapter on truffles, brittles, and candies is brimming with wonderful and generally easy ideas for delicious gifts or treats for special occasions. It’s been a long time since I made truffles, one of my favorite decadent chocolate treats, and I felt that situation needed to be remedied. The thought of Earl Grey, my favorite tea, paired with rich, dark chocolate was all it took. 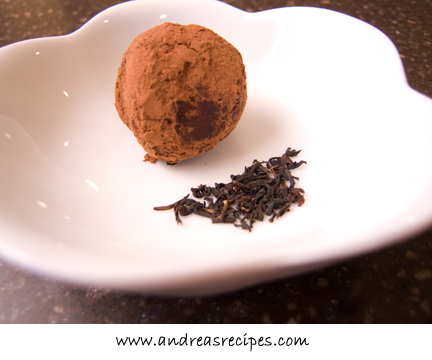 The aroma of the tea leaves steeping in the cream was intoxicating and I could hardly wait while the truffle mixture cooled in the refrigerator. I had chocolate all over my hands by the time I finished rolling the truffles, and I couldn’t put them away without tasting just one. So rich and satisfying, and the Earl Grey offered a sumptuous background note, not overpowering in the least. 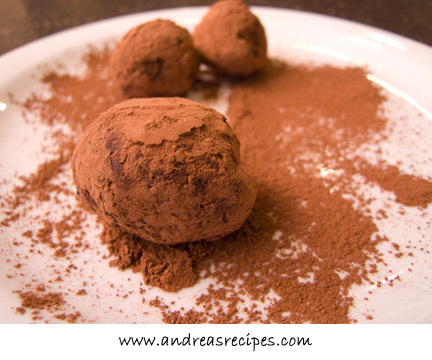 Truffles are very easy to make, and Murphy’s simple directions make them even more accessible to a truffle novice. And as we approach the summer fresh fruit season, I can’t wait to try all the recipes calling for fresh fruits, including her preserves. I love this cookbook and my family is enjoying everything I’ve made from it. 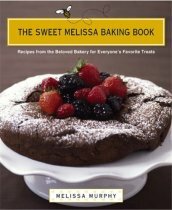 Adapted from The Sweet Melissa Baking Book, by Melissa Murphy. 1. THE BATTER (MIX AT LEAST ONE HOUR BEFORE): In the blender, combine the milk, and eggs. Pulse for a few seconds to blend. Add the flour, sugar, and salt. Pulse until the batter is smooth and has the consistency of heavy cream. Don’t over mix. Allow to sit covered in the refrigerator for at least one hour or overnight. 2. COOK: Preheat the crepe pan. Rub it with a few drops of oil. Check the heat by putting a drop or two of batter on the skillet. If it sizzles, the pan is ready. Pour about 1/4 cup of batter onto the hot pan, then quickly pick it up and swirl it around so that the batter spreads into a circular shape. It may take a little practice, but it’s pretty easy. 3. When the surface of the crepe appears dry, use the nonstick spatula to carefully loosen the edges, then quickly flip it over. Remove from the pan almost immediately and lay the crepes on a board, covered with a towel to keep them warm. 4. 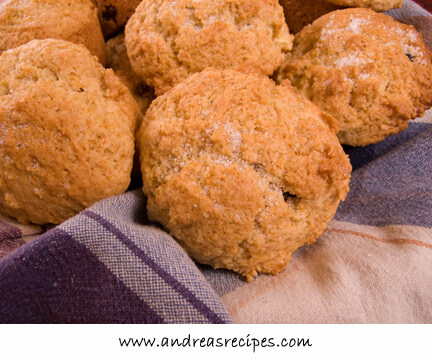 Serve warm filled with jam, or fried apples, or just about anything that sounds good. Savory crepes filled with goat cheese, roasted, vegetables, and fresh herbs make a delicious lunch or appetizer. The batter will keep for up to 1 month in the freezer. After thawing, whisk well to recombine. To keep the cooked crepes, place each one between layers of wax paper and put them into a plastic zip bag. You can also freeze them wrapped in aluminum foil. Thaw while still wrapped. 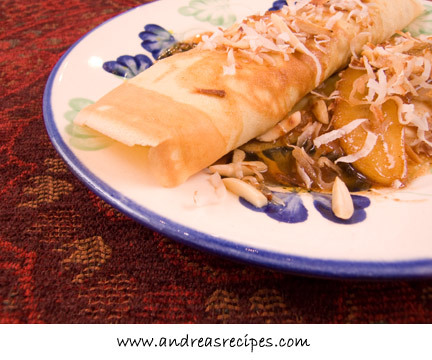 To reheat the crepes, lay each one on a hot crepe pan or griddle for a few seconds on each side. It is just a wonder of a book Andrea! 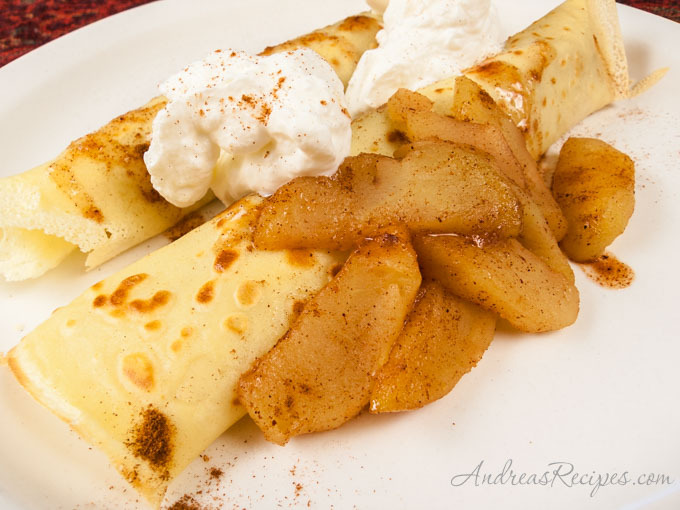 I love the apples with the crepes, beautiful photo! I was so surprised how much I love crepes when I finally tried making them and they weren’t so hard as I’d made them out to be. Like that idea of Dessert for breakfast!! I just had to buy a copy after hearing such great reviews. I received mine, but I’m not as good as you – I haven’t made anything yet. I better get with it! I have to get myself that book too! Beautiful website! Thanks, Andrea. This sounds like a good one.